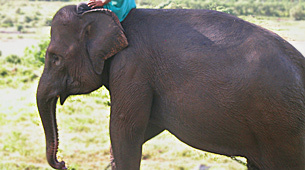 The Sri Lankan people have had a long association with elephants. Elephants were used by the ancient kings for war, ceremonial purposes, and as gifts to kings and potentates of other countries. Temples had elephants, which took part in religious ceremonies and parades. This long association with man helped to develop a lasting affinity between man and elephant in Sri Lanka. Now the number of wild and domestic elephants in Sri Lanka is diminishing and it is time to make a comprehensive survey of the domestic elephants to ascertain their present status. This survey will not only enable us to find out how many elephants there are but it will also give us an insight to the expectations, aspirations, and ideas of their owners. This will help policy makers to make decisions with regard to the future management and conservation of the domestic elephant population in Sri Lanka.